A Reddit post notes the ubiquitous use of Macs by developers and asks why that should be so. Plainly Linux costs less and doesn't suffer from the real and imagined defects that respondents point out. What they always miss is that the Mac users aren't fanatics. They just want to get their work done. 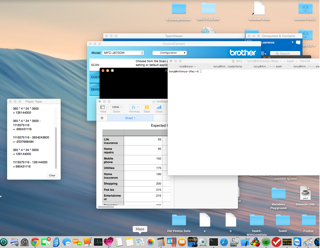 OS X gives them a familiar Unix shell, a comfortable and predictable GUI and that's what they want. If they need real Linux or Windows or anything, they can install it in a VM. A Linux user cannot legally or easily install OS X; so OS X is the only platform that gives you that flexibility. Linux distros don't help either. Ask Google a question about Linux and you may get a wide range of perfectly correct answers but those who answer don't always bother to point out what distro their answer applies to. It's often easier to get answers to OS X problems and you almost never run into snarky RTFM responses. Moreover, you WILL encounter problems with Linux updates because your hardware isn't what the Linux developers expected. OS X knows what its hardware will be because Apple made it. Commercial app support, while not as all encompassing as Windows, is far, far better than it is on Linux. Again, that's because of the wide distro differences. I'm well aware that everything I said here will infuriate some True Believers and I get that. I even sympathise to some degree: Linux and Open Source are important and I have mentioned before that I sometimes feel guilty for being lazy and opting for Mac. But the fact is that I just want to get my work done. Windows would make that very difficult. Linux wouldn't, but it has its own issues and requires much more care and feeding. Windows is crap, Linux is high maintenance and OS X mostly stays out of my way. It's that simple, really. This website runs on Ubuntu. I'm typing this there in an ssh session launched from OS X terminal. I wouldn't run my website on Windows or Mac OS X because that would be difficult and annoying. But for my daily work, OS X is where I will be. Convenient and predictable wins. As a Linux user I find I am in agreement with some of what you write. The hardware compatibility issue you mention is accurate of course. Is it worth paying double or more? I think not. As for the interface, for a long time MacOSX has been the the most loathsome interface I have ever used. However I must admit that Ubuntu Unity is actually rather worse. But now that Xubuntu has reached a reasonable bug free status I need not think about interface issues. Hardware issues? I have been building my own computers for 15+ years now. I have not had any such. But I must admit that I check online before committing myself to any purchase of peripherals. But that's YOUR view. The majority see it just as I described it.